I’m taking multiple medications for my blood pressure and diabetes, plus medication for acid reflux and a sleeping pill. I worry about mixing so many drugs – can I stop any of them? You’re right to ask why you need to continue taking each of your medications as there are definitely risks involved with what we pharmacists call “polypharmacy” – that’s using multiple medications to treat your medical condition(s). Most commonly that means a person is taking five or more medications. The conditions you’re being treated for – hypertension and diabetes – are conditions that commonly require more than one medication to control, so your situation isn’t unusual. But… let’s face it, depending on your health plan, purchasing all those drugs can be expensive, so polypharmacy definitely leads to increasing costs for you and your employer, but what should concern you even more is that polypharmacy increases the risk of “adverse drug events.” The more medications a person takes, the higher the risk. By adverse drug events we mean harm caused by a medication, for instance, confusion, falls, low blood pressure, and bleeding. These can be serious: one-in-nine emergency department visits are the result of an adverse drug event, and the majority are preventable. So by appropriately decreasing the total number of medications you take, you’ll lower the risk of adverse drug events. 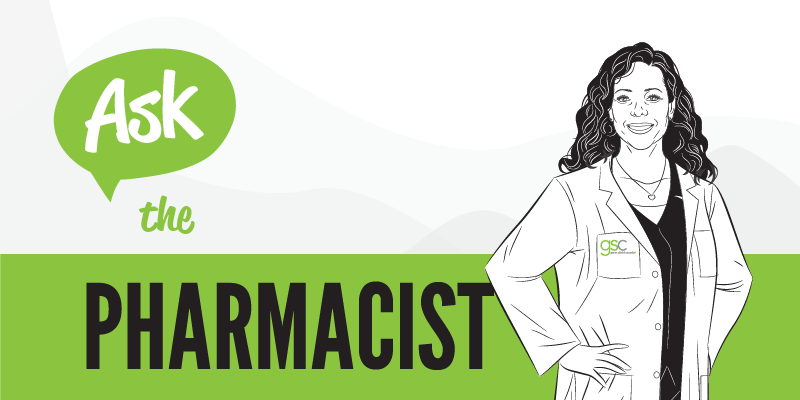 Doctors and pharmacists are in fact able to “de-prescribe,” or safely stop or reduce medication that may no longer be needed or may be causing harm. Drugs commonly targeted for de-prescribing include some medications for pain, allergies, acid reflux, and sleep. (For more information on treating insomnia read our Ask the Pharmacist Q&A from September 2016.) As well, over-the-counter medication and natural supplements also carry risks and should always be assessed by your doctor or pharmacist to determine the benefit and/or risk of continuing their use. To find out which of your medications may no longer be necessary and could be stopped, I suggest you work with your pharmacist. After that, you should likely meet with your pharmacist at least once a year for a new review.